Private Maden was the husband of Mrs. E. Maden, of 10, Duke St., Harle Syke, Burnley, Lancs. A very well-known young man in Harle Syke, Pte Walter Maden, 102543, of the Machine Gun Corps, of 10, Duke-street, has died from wounds, his wife having received the following official telegram:- "Regret to report your husband died Sept. 27th with gunshot wound in the forehead." The deceased soldier, who was 23 years of age, and leaves a widow and one child aged fourteen months, was an only son, and had lived in Harle Syke since he was fifteen, and was the adopted son of Mr. and Mrs. Dixon, 109, Burnley-road. He had been a tackler at the Walshaw Manufacturing Co's mill for the past six years, and he had previously been a weaver there since a youth. he was connected with the Wesleyan Church at Harle Syke. 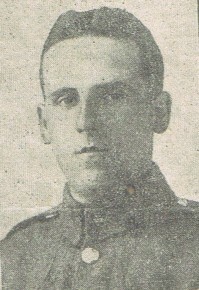 Pte Maden joined up on February 15 and went out on July 15. Second-Lieut. A. Dunton writes to Mrs. Maden as follows: - "Dear madam-You will have received by now the official intimation that your husband has died of wounds in hospital. I cannot properly express my sympathy with you in your great sorrow. It is a grief to me to lose some of the best of the men in my section, and the only consolation is that they had played an indoubtedly gallant part in a successful operation. Your husband was always cheery, nad was very popular with his fellows. He received a shrapnel wound in the head, and was unconscious when we took him to the dressing station, where he received immediate medical attention, and I had hoped that his wound would prove to be less serious than we feared." Correspondence - Mrs E Maden applies for L/husband's medals 21 9.7. ?